CPQ (Configure-Price-Quote) systems and sales portals are perfect for each other. Sales portals have been in the business-practices discussion for many years. The digitisation of business practices and the deployment of web-enabled applications designed to facilitate collaboration have provided an environment that’s friendly to the development of portals for sales teams. Individual sales reps or the sales force, as a whole, can benefit greatly from a single point of access through which sales can access tools to configure, price, and quote products and solutions for prospective buyers. The buying experience is greatly enhanced by ensuring accurate sales quotations that are delivered quickly. This is a great way to facilitate customer satisfaction from the earliest moments of a business relationship. The idea of providing sales portals to salespeople is intended to address these elements. Without the portal, sales reps have to spend huge amounts of time searching for all the critical things they need to engage with prospects. They need customer data and prospecting lists, usually in some intelligent sort or filtered by market, size, or business type. They need product messaging, collateral, and ultimately pricing and availability information as well as the ability to engage with many back-office functions―sometimes via the resident Enterprise Resource Planning (ERP) system―to complete these searches. These functions include finance, management, marketing, product management, engineering, and others. In almost any business environment, this is time-consumptive. In larger, more complex organisations that feature complex products and address complex markets, the time requirement can easily translate into a bet-your-paycheck proposition for the sales rep who’s seeking a high-probability engagement. The sheer effort required to locate the correct information source may include lengthy phone searches or extended corporate HQ hikes to physically establish contact. How does CPQ Enhance Sales portals? The search time for critical information is dramatically reduced by placing it all within the sales portal. Additionally, the correct information source for each type of information required has been pre-selected during the implementation of the CPQ solution. The searching sales rep does not have to wonder if he or she has really found the truth. Once engaged, the quoting process begins. This is where advanced CPQ can help address the three factors identified above. A product configurator guides the sales rep through the customer interviews to ensure that all the knowledge required is gathered to put together a solution that matches the customer’s needs. Advanced quoting software will produce an accurate Bill of Materials (BOM) and price quotation for the configured product as well. The basic strategy with almost any sales portal is to gather all of the resources required by Sales into one location. In the old days, this was an area in the sales office that held collateral, order forms, price lists, specification libraries, territory maps, and other things that sales reps were likely to require during the prospecting and quote processes. The online manifestation of this is the sales portal. Many of the same resources are located or scripted interviewing processs that is interactive in nature. Questions are asked, and the answers provided by the customer drive the next series of questions to consider. As this information is collected, CPQ begins to offer product-solution suggestions and configuration options, again driven by the information supplied by the customer. At the conclusion, the product is fully configured, a BOM is created, and a price quotation and proposal can be generated. This is accomplished quickly and accurately. 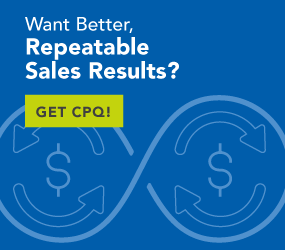 CPQ is the ultimate manifestation of the effective sales portal. It makes the sales rep more productive by reducing the time and effort required to build a configured solution and to deliver a quotation or proposal. It employs all of the knowledge required and available without requiring the sales rep to remember technical specifications or other highly detailed information. CPQ boosts sales, makes sales reps more efficient, and ensures customer satisfaction throughout the buying transaction and beyond.